Teacher: Welcome class to the lesson on essential guitar techniques. In this lesson you will study Harmonics. You'll learn all kinds of tricks and riffs. Let's get started with the basics. A harmonic note is mostly a sub harmony note of the original pure fretted note. 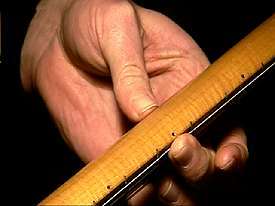 Here's a regular fretted note on the 5th fret. Teacher: To play a harmonic you have to barely touch over the fret. 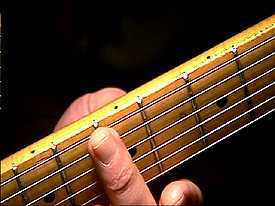 Make sure you do not press the string to the fret. Teacher: Here's another angle of this technique. Teacher: Here's what the actual WAV file of the comparison between a regular note and harmonic. Notice how the left example on the image is dense on the bottom of the graph, then evenly distributed in the center and breaks up on the top portion. The harmonic note (right) is more dense on the outer edges of the graph. Teacher: Here's a basic comparison of an open note, then fretted on the 5th fret and then played as a harmonic on the 5th fret. All the harmonic notes will be highlighted. Teacher: Now you can play harmonics on the 12th fret, the harmonic on this position actually matches the fretted notes as well. Teacher: The 12th fret is a very common position for playing harmonics, other positions include the 5th and 7th frets, here's the positions. Teacher: Now there are harmonic positions all over the neck, here are a few harmonic positions as well. Teacher: You can also use harmonics to tune you guitar. The 5th fret/6th string and 7th fret/5th string harmonies should match, if they are off there would be phasing when both harmonies are played, here's an example. Teacher: When I first play the notes you might notice how the notes phase, I later tune the note until they match. The video will give you a better idea of using the tuning method. 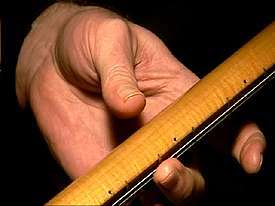 This tuning technique also works on the other strings as well, except with the 3rd and 2nd strings where you have to use regular tuning. Here's an example. Teacher: Notice the 3rd string is out of tune, then I adjust the tuning to match and cancel the phasing. Let's move in to some harmonic riffs. You might recognize this melody. Teacher: Notice I play the same melody on the different harmonic fret positions. Sean: what melody is that? Teacher: That is a military wake up call, "Rebely" Remember to touch lightly over each fret. Make sure you don't press on the middle of the fretboard. The video illustration will help to visualize the technique and picking. Here's another melody you can try. Teacher: This military melody (Taps) uses the harmonics on the 12th fret, and then play a regular note on the 15th fret/2nd string. Teacher: Audio, yes you can use other harmonic notes to match the 15th fret note on the Taps melody. OK, let's get into some riffs played by famous guitarists. This first riff is used by Steve Howe of Yes. Teacher: Here's a harmonic riff used by Jimmy Page. Teacher: Notice how you vibrato the 12th fret/3rd string harmonic using a technique where you bend the string above the nut. This technique can be seen better in the video. sammy_andrews: But I have a locked nut...?? Teacher: Sammy, use your tremolo bar then. Teacher: Skip, you push the string downward above the nut. Here's a harmonic riff uses by Alex Lifeson of Rush. Teacher: This is a pretty cool riff, you position your 3rd finger over the 12th harmonic fret position, and then jump to the 1st finger on the 7th harmonic fret position. It's a little tricky to get down, but keep practicing. Here's are some various harmonics riffs. Teacher: This harmonic riff climbs between the 7th and 12th frets. Here's the next riff. Teacher: This riff uses double-stop harmonic notes that descend the Am Pentatonic scale pattern. Here's the next riff. Teacher: This is an interesting climb using harmonic notes. Jumping for 5th fret then skipping a string and to the 12th fret is a bit challenging. Here's the next riff. Teacher: More harmonics descending the A Minor Pentatonic pattern. Here's the last harmonic riff. Teacher: This harmonic riff uses the 5th and 4th positions. You play just off of the 4th fret to produce that harmonic, check out the video to get a better idea of the position. Teacher: Well time to go, hope to see you all next lesson. You will learn harmonic picking, false harmonics and other unusual harmonic techniques! sammy_andrews: Great!....looking forward to it....thanks! !